There are times shooting when my waist pack needs to carry some lenses, some lighting gear, a few batteries, and allow me to quickly work out of it. The obvious bag of choice for me (most of the time) is the Mountainsmith Tour. My “shooting on the run” set up is a mix of gear that allows me to handle a wide variety of situations with a minimal amount of equipment. This kit often goes out for quick location portraits or engagement sessions being shot in totally uncontrolled environments. Generally these uncontrolled environments are out in the street, in a very busy and public building or needing to light a shoot, while walking with my subject. 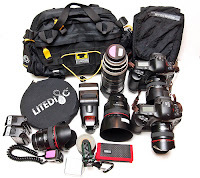 By carefully choosing my equipment and knowing how to maximize the available space in the Mountainsmith Tour I can carry a wide variety of equipment around my waist, while keeping a small “footprint” while shooting. When working on the street, or in an uncontrolled environment, the less space you occupy, or smaller footprint you create, the more maneuverable you become. Maneuverability equates to flexibility in shooting, which allows for a much more fluid shooting style, especially when working alone. By working with smaller prime lenses I find I able able to be more flexible in my packing options. This flexibility in packing allows me to work “differently” such as carrying a small, easy to handle, reflector that I can fold up and stuff in my waist pack. The beauty of the Photoflex 22″ LiteDisc is that it can opened quickly, held in my left hand to direct the light while holding my cameras up with my right hand and shooting at the same time. Yes an assistant would be easier, but I generally work alone, so my kit is designed to allow me multiple options while only being able to rely my skill of working alone. Below is a photo of my general set of up this kit. i use a lot of thinktank ‘modulus’ belt gear that works in similar ways… have you tried it ? their “changeup” bag looks at a glance very similar to the mountainsmith bag you talk about here (although i’ve not tried it). Holding a small reflector and a camera while shooting with smaller lenses is not had challenging as it sounds. It takes some practice, but once you get used to it, it’s quite simple. 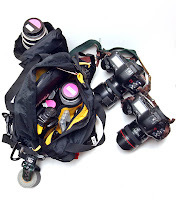 I have tried the ThinkTank bags, I love ThinkTank and their products. I think ThinkTank is one of the best manufacturers out there in terms of quality and customer service. I have been using the Airport Addicted backpack for three years and love it. As for using the ThinkTank waist packs, they do not work for me, nor do the pouches. I choose to use the Mountainsmith Tour pack, and the Newswear Pouches, because they lay flat when empty. By using bags/pouches that are very unstructured when empty I can gain considerable space when packing these items, or lashing them to the outside of a bag. For my uses I find the Mountainsmith Tour has some other advantages as well, such as the adustable tension straps to adjust the height and depth of the bag when on me. This is something that makes wearing the Mountainsmith Tour more comfortable than any “photo specific” bag out there. Hope that answered the question. Great blog,thanks for all the tips,all though I am not a big flyer I have nicked a few of your ideas the Moleskine pockets and putting tape on body and lens caps being just a couple ! How you getting on with your 5D’s ? I am happy you have been able to apply some of my tips to non-flying uses! The information on my site is not always travel specific. The Moleskin notebook and “pockets” are great for many uses. Taping your gear, to me , is just a logical way to not lose any items at home or on the road. i should be adding my 5Ds before the wedding season begins (after Canon announced a 5D MkII and the used market for 5D bodies gets flooded with low cost 5D bodies! ).